Vladimir Putin's return to Kremlin marks a continuity in Russia's foreign policy. India can expect stronger bilateral ties with Moscow. The global image of Vladimir Putin may have taken a dent after a wave of popular demonstrations that whipped up speculation of a “Russian spring”, but in India he is much esteemed for forging a privileged strategic partnership with New Delhi after the chaos and drift of the Yeltsin era. Putin’s third term will also coincide with a renewed momentum in bilateral ties. Putin’s India policy will build upon the successful 12th summit in Moscow in December last year when India and Russia signed a clutch of pacts and decided to accelerate their ties in areas ranging from nuclear energy, defence and space to education, culture and trade. In January, Russia handed over K-152 Nerpa nuclear-powered attack submarine to the Indian Navy on a lease of 10 years. There are also joint efforts to scale up bilateral trade which is less than $10 bn. On March 6, shortly after the election results were officially announced, Putin told journalists in Moscow that there will be no dramatic changes in Russia’s foreign policy. However, India will be closely watching how Putin recalibrates its relationship with the West and the US as there is a certain unease in New Delhi with his combative anti-West rhetoric ,which was reflected in his pre-election speeches. “Overall, Putin sees this world as an extremely risky and hostile environment. Success is only possible if based on use of power and this must be real “hard” power. Russia is reckoned with and respected only when it is strong and stands firmly on its feet,” says Fyodor Lukyanov, editor-in-chief of the magazine Russia in Global Affairs. India, however, sees a resurgent Russia as a balancer in global politics, but given its burgeoning relationship with the US, New Delhi is hoping that Moscow’s reset with Washington continues apace. India will also be watching Putin’s moves towards China as he sees Beijing as critical to his plan to develop Siberia and the Far East and Moscow’s strategic and economic goals in the Asia-Pacific region. 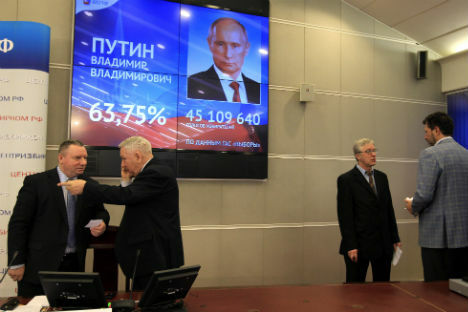 By and large, one can expect greater realism in Russia’s foreign policy as Putin seeks to leverage Moscow’s external relationships to create a modernised, innovation-focused economy and delivers on his poll pledges to satisfy his domestic constituency. The economic imperative is thus going to dominate in Russia’s international relations – a trend that is going to get greater salience with Moscow’s entry into the WTO and Putin’s pet project of the Eurasian Union. Pushing for a more robust multipolarity in international relations will be a defining theme of the third incarnation of the Putin presidency. Putin has pointed out that the growing economic clout of the BRICS nations gives them a critical role in reshaping the global governance system. It’s not clear yet who will represent Russia – Medvedev or Putin - at the March 29 BRICS summit in New Delhi, but one can expect a renewed call by Moscow to create a more democratic world order and fresh reassurances about taking the crucial India-Russia strategic partnership to new heights. Manish Chand is Senior Editor with IANS and a New Delhi-based writer on international affairs.